Produced from an exceptional terroir, Le Petit Mouton de Mouton Rothschild is the second wine of Château Mouton Rothschild. Made with grapes from selected younger vines in the illustrious First Growth vineyard, it is harvested, vinified and bottled with the same scrupulous attention to detail. Harvested in small, open baskets, fermented in the Mouton oak vats, matured in oak barrels in the traditional way, all the conditions are met for the wine to express the elegance and richness of a great Pauillac. In order to link the second wine more closely with its famous elder, illustrated by great artists since 1945, Baroness Philippine de Rothschild has chosen a label for Le Petit Mouton de Mouton Rothschild inspired by a drawing by the famous poster artist Jean Carlu. A variation on the theme of the vine, the powerfully coloured drawing combines sensual shape with the clean geometries of the Art Deco style. It was made in 1927, following the artist's design in the same period for the label for Château Mouton Rothschild 1924. 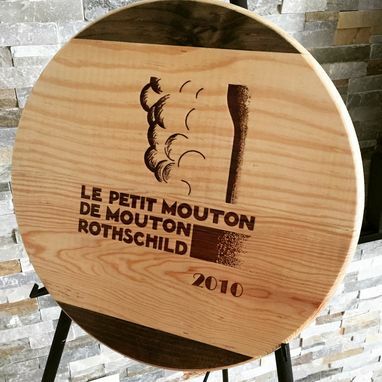 The first vintage, 1993, was called Le Second Vin de Mouton Rothschild, but it has borne its definitive name (which has a family connotation, Petit Mouton being the name of Baroness Philippine's residence in the heart of the estate) since the following year, 1994. This Offer is by far the better price you'll find for similar product. My Listing includes One Lazy Susan with the specify diameter + 5/16 Thick turntable Bearing... .